During the week of March 4-8, 2019, a group of nine students and one staff member from Appalachian State University volunteered here at Hope Springs Farm. Students had the opportunity to volunteer in various ways during their week, from working out in the pastures with the animals, to going on community outings with Growers. They also helped grow vegetables in the Greenhouse and assisted Growers with cooking and crafting activities. The farm grounds were snow-covered the entire week, but students braved the cold temperatures to make a difference in the conditions on the farm for our animals, Growers, and staff. The Appalachian State volunteers got involved with this experience through the Appalachian and the Community Together (ACT) program at their University. The first week of March is the ACT’s international and domestic spring break program, including opportunities for students to volunteer at non-profits across the country and world. The program is referred to as an alternative service experience, or ASE. ASE programs are social issue-focused rather than destination based because they are more than just opportunities for student travel. This group of students viewed their week as an opportunity to learn about and experience the issues that confront people with disabilities. They wanted to explore the spheres that affect their daily life, as well as gain some hands-on experience by working alongside our Growers. The group of volunteers partnered with the Scholars with Diverse Abilities Program (SDAP) at Appalachian State, which is a program that helps enable everyone to have access to higher education, no matter what their ability. Each ASE is led by peer leaders, who are undergraduate students, and one staff member serving as a learning partner. Kelsey Trevethan of Wilkes Barre, PA was the staff volunteer coordinator for this service trip. She was asked by student leaders Michala Penninger, Cat Peirce, and Germaine Horodyski to embark on this special volunteer experience. During her time as a student at Appalachian State, Trevethan volunteered often with individuals with disabilities, so she was excited to be asked to lead this trip. When asked what her personal goal of this volunteer experience was, she responded, “I want to learn what it means to be a Grower. And I learned that it means to have a community of people who care and support your growth as an adult with a disability.” Her favorite part of volunteering here was spending time watching the interactions between Growers and animals during the morning and afternoon animal care sessions. Student volunteer, Gabby Lamb of Cary, North Carolina, said that this is her first volunteer experience to this capacity. She, along with several other volunteers in the group, were not very experienced with farm chores, but they were eager to do whatever work needed done by following instruction. During her week at the Farm, she enjoyed cleaning the horse and pig stalls, as well as organizing and helping in the office. “We’re doing things that may not have been getting done here otherwise. The staff’s first priority is the Growers, so cleaning can get forgotten,” she noted. Hope Springs Farm is very grateful for every volunteer, whether an individual or member of a group. It means so much to us that a group of students traveled all the way from Boone, North Carolina and spent their Spring break helping the Farm keep up with all of its needs. The PA Farm Show rolls around every January, attracting residents from around the state with its delicious food and array of animals. Here at Hope Springs Farm, we use the show as inspiration for a month-long activity calendar. Throughout January, Hope Springs Farm Growers participate in special animal care, gardening, crafts, and cooking activities to embrace the month of the famous PA Farm Show. Growers complete Farm chores, community service, and other activities year-round, but January is special. Growers dress up the many farm animals—alpacas, sheep, goats, miniature horses, etc. and enjoy snapping photos of the dressed-up animals. They take the animals on walks, and brush and feed them. They learn about the animals from Hope Springs Farm staff and make posters to display the information they’ve learned. In the kitchen, they make milkshakes, inspired by the PA Dairymen Association’s irresistible milkshakes, that all locals know and love. They also make homemade butter, baked potatoes, and mozzarella sticks to model some of the savory foods available at the Farm Show. Fairy Gardens, miniature gardens complete with structures and actual living plants, are designed and built by Growers, influenced by the display of these gardens at the Farm Show. At the end of the month, Growers will vote for which of their peers created the best Fairy Garden. In the craft room, Growers create friendship bracelets, felted bowls, roving coasters, and felted cookie cutters. Thanks to the PA Farm Show, Hope Springs Farm Growers are enjoying themselves and their activities even during the cold month of January. If you would like to help keep these wonderful programs going strong Click here to donate to our Farm Programs. If you want to stay informed about all our fun programs here at Hope Springs Farm, Click here to subscribe to our newsletter! Celebrate Giving on November 27th! #GivingTuesday is a global day of giving that harnesses the collective power of individuals, communities and organizations to encourage philanthropy and to celebrate generosity. Following Thanksgiving and the widely recognized shopping events Black Friday and Cyber Monday, this year’s #GivingTuesday will kick off the giving season by inspiring people to collaborate and give back. Hope Springs Farm will participate for our first time in this worldwide event on November 27th, 2018! We will complete our share of giving by sharing your donations on this date with the rest of our community through our Sharing Hope program, volunteer activities, and other community programs in which Growers participate. When you make a donation, you have the option of requesting a local charity in which we will share your donation with. Growers will use your donation to shop for the items on that charity’s wish list and then deliver the items! This gives Growers a sense of meaning and value in the community and they love doing this kind of volunteer work. This year, our Growers participated in countless volunteer and community activities. They packaged boxes for Operation Christmas Child, delivered meals for Meals on Wheels, sorted and bagged food at the Caring Cupboard, assembled kits for hospitalized children at Caitlin’s Smiles, etc. They also volunteered at the Ronald McDonald House, Hershey Gardens, food banks, nursing homes, and other local places. Staff took Growers on fun community outings to other local attractions such as the movies, bowling, libraries, malls, markets, and more. Donations on #GivingTuesday will help us continue to provide Growers with opportunities such as these so that they can continue to make a positive impact on the community and on themselves. The reason for the hashtag in #GivingTuesday is to encourage donations on this date to be given through Facebook and online sites. For 2018, Facebook and PayPal have pledged to match donations of up to $7 Million! The earlier you visit our Facebook page and donate, the more likely part of that $7 Million will go to Hope Springs Farm. Last year on Facebook alone, #GivingTuesday raised $45 Million for 47,000 nonprofit organizations. Our goal is to raise $5,000 to share with our community through the various programs Growers participate in. If you don’t have a Facebook, you can visit our donation site to contribute to our #GivingTuesday fundraiser. 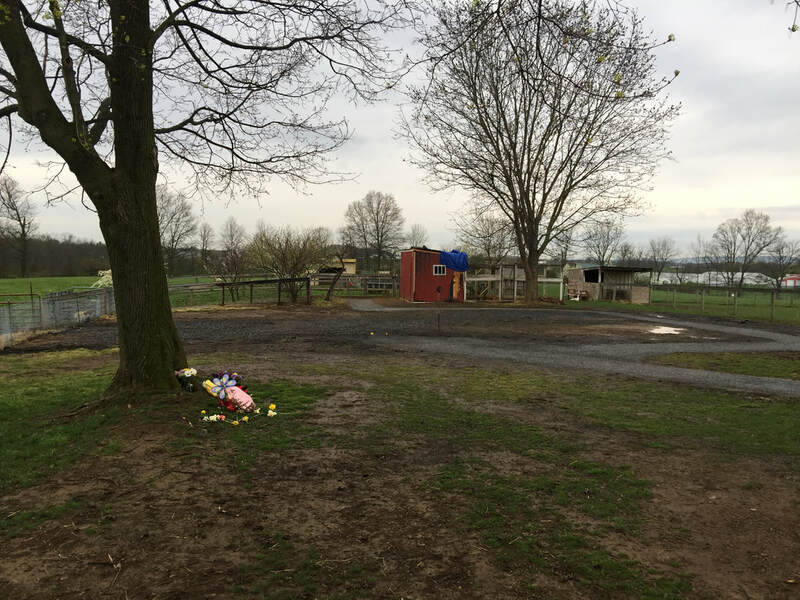 We hope that you kick off the giving season by giving to us here at Hope Springs Farm! Thank you for your support! 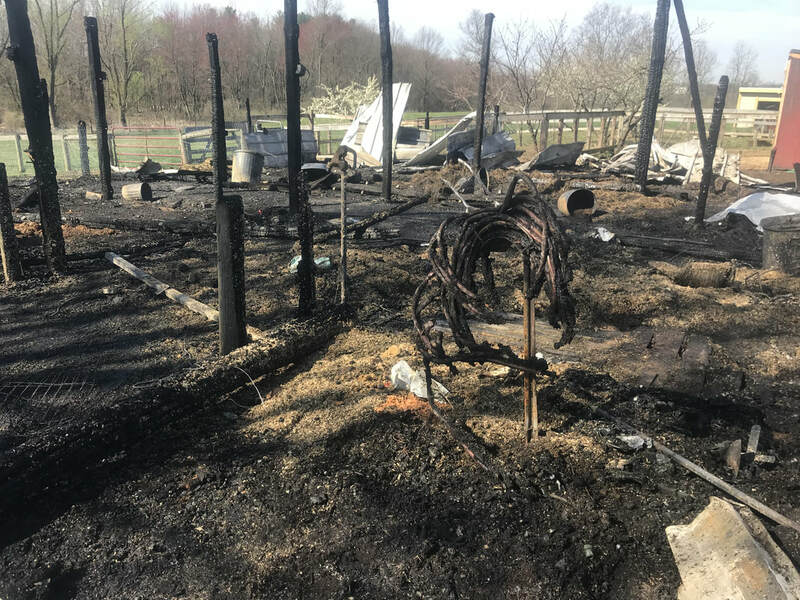 The fire that devastated our Farm Monday April 23, 2018 and took the lives of our two mini horses Bunny and Brownie, two small rabbits and a couple dozen new little chicks, has been all cleaned up and our Growers are back to work taking care of their animals and gardens. We have also had lots of offers of donations of animals, equipment and all the little things we need to help the Growers take care of their Farm, and volunteers to help out around the farm and when it's time to re-build. We also want to say Thank You to every one who donated to the GoFundMe page Kendra Earl Warlow started for us first thing Monday morning. Just click on the links below to see the page and donate to help our recovery. We also have our NetworkForGood Donation site that you can donate to as well. And as always you can send a check to Hope Springs Farm 201 Trail Rd Hershey PA 17033. There will also be some fundraisers going on to add to the recovery. We will keep them posted to our facebook page; https://www.facebook.com/Hope-Springs-Farm-100371503721581/ or you can just type in Hope Springs Farm in the search bar, be sure to Like and Follow us, and keep an eye on the Events tab to see where we will be next. Here are some that have been confirmed; stay tuned we will be doing lots more. Saturday, April 28, 2018 @ 11 am at Darrenkamps, 191 Ridgeview Rd. S. Elizabethtown PA 17022, one of our Families will be selling baked goods and HSF items. Tuesday, May 8, 2018 @4pm to 9pm at Penn Hotel Sports and Raw Bar, 600 Old W Chocolate Ave Hershey PA 17033, they will be donating a portion of their proceeds to the Farm. Wednesday, May 16, 2018 @ 5pm to 9pm at The Annville Grille, 103 W. Main St Annville PA 17003, they will also be donating a portion of the proceeds to the Farm. Thank you to all our Friends and supporters! ​What is that you smell? Zucchini Bread? Pumpkin Rolls? Frittata? Stuffed Pepper Soup? Cookies!?! When you take a tour of Hope Springs Farm, you are bound to smell something savory being concocted in the kitchen. A week never passes where a new creation is not being made. The Growers work in the garden and greenhouse and then use their harvests for recipes. They plant seeds, see the seeds sprout, witness the beauty of the blossoms, gather the bounty, and then prepare dishes fit for a King! (Well, not always..!) Sometimes, we have failures (like those cookies with a tablespoon of powder instead of teaspoon of soda), but it is always fun! Some of our Growers have never had the opportunity to bake or cook, so we teach them how to measure ingredients, make a creation, and have fun at the same time! Did I mention that time when we just added the powdered sugar to the mixer and someone turned it up full blast and the ingredients went EVERYWHERE!?! There is never a dull moment in our kitchen! Being able to follow a recipe, using fresh ingredients from your own garden, and creating a dish from scratch is somewhat of a rarity these days. When the Growers see (and taste!) the final product, they are so proud of what they accomplished. To give the Growers a meaningful and blissful life is how we thrive. We cannot think of a sweeter experience! Hope Springs Farm has many talented staff and friends who contribute to our Blog.